SSMS is an Indonesian palm oil company operating in Central Kalimantan. The company is under control of Abdul Rasyid and his family. As of Q2 2016, SSMS had a landbank of 100,000 ha, of which 70,000 ha were already converted into oil palm plantations. SSMS’s parent company PT Citra Borneo Indah also has its own oil palm businesses. SSMS does not have a public NDPE policy. The company has been a member of the RSPO since April 2007. Two of its five palm oil mills and supply bases are presently RSPO certified. It aims to achieve 100 percent RSPO certification for its own operations by 2018. In March 2015, SSMS submitted an RSPO New Planting proposal, planning to convert more than 10,000 ha of lowland tropical rainforest (potential or actual orangutan habitat) into oil palm plantations. Two NGOs filed a complaint with RSPO, arguing that documents with regard to High Conservation Value areas and Free, Prior and Informed Consent were incorrect and flawed. At the same time, another NGO reported on recent clearings of peatland forests by an SSMS subsidiary. 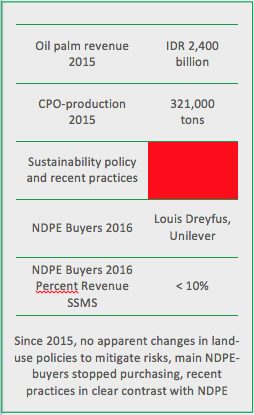 In December 2015, SSMS sold the concession with the pending RSPO complaint and another highly contested concession. The buyers could not be identified through notary acts. It can also not be ruled out that the companies are still under control of Abdul Rasyid and his family. SSMS acquired two plantation companies in Central Kalimantan, PT Menteng Kencana Mas (PT MKM) and PT Mirza Pratama Putra (PT MPP). The concessions comprise 27,000 ha, of which around 18,000 ha are not yet planted. PT MKM is likely predominantly located on peatland, though the concession area is not clear. In Figure 6 shown below, drone imagery recorded active deforestation in PT MPP in May 2016. 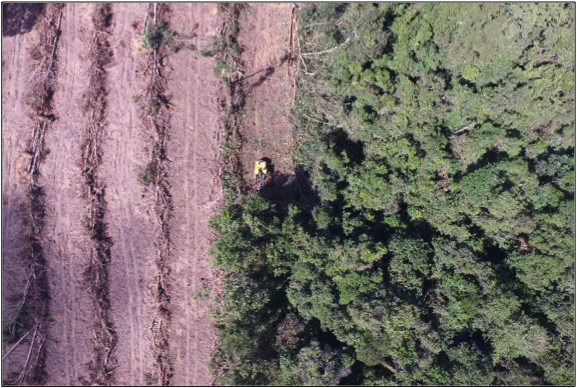 Figure 6: Deforestation by SSMS’s PT Mirza Pratama Putra in May 2016. Coordinates: 1°58’35.40″S; 111°30’53.26″E.